The airline stood out from the competition in 2018, at a key moment in the company’s history: the year of its 20th anniversary and of the renewal of its fleet. PAPEETE, TAHITI (December 17, 2018) - Air Tahiti Nui received the prize for “Best Touristic Video,” awarded by the tourism trophy jury. The trophy was awarded on December 1, 2018, at a special ceremony held in the presence of the Minister of Tourism, Nicole Bouteau. Following the theme of the evening, the participants and spectators took a trip back in time into French Polynesian history and “The Bounty.” With a superb video, Air Tahiti Nui took first prize in its category by seducing a jury that included the Minister of Tourism, the Minister of Culture, Tahiti Tourism, the tourism service, the Authentic Tourism Association and the travel agency union. 2018 has also been a year for the company to position itself as a market leader by winning the prize for “Best Airline in the South Pacific.” This prize is awarded by Global Traveler magazine based on its annual survey with frequent luxury and business travelers. This is the fourth time in six years that the company has earned a place on this list, which is highly regarded by the industry’s biggest airlines. Each year, Global Traveler readers give their opinion about airlines, hotels, customer loyalty programs and travel-related products in over 80 categories, allowing the magazine to publish one of the most reputable surveys in the sector. The winners received their awards at a reception held on December 12, 2018, at the Peninsula Beverly Hills, in California. “As we celebrate our 20th anniversary and the launch of our Boeing 787-9 Tahitian Dreamliner, this news couldn't have come at a better time,” declared Mathieu Bechonnet, Air Tahiti Nui vice-president. “We are truly honored to receive this recognition as we continue to demonstrate our team’s commitment to providing our customers with exceptional service and genuine experiences aboard our aircraft, allowing customers to live the most immersive travel experience in the world. A third prize was added to the silverware with the “Best New Livery” prize, awarded at TheDesignAir Awards 2018. The first Tahitian Dreamliner was put into service in November 2018. The new, lagoon and light blue colored aircraft didn’t go unnoticed by the sector’s professionals. Its Polynesian tattoo motifs and colors helped take home this prize. The last Air Tahiti Nui 787 livery is the incarnation of a design that reflects the roots and culture of the company’s origins. 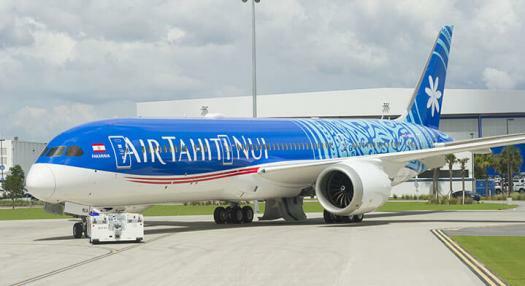 With a bright, colorful design and floral, emblematic motifs, the Air Tahiti Nui 787s will certainly captivate the imagination of travelers from all around the globe,” states Jonny Clark, TheDesignAir founder. With the renewal of the Air Tahiti Nui fleet, the Tahitian Dreamliner crews received a surprise visit from famous Apollo 11 astronaut, Buzz Aldrin, during a visit to the aircraft organized by the company’s U.S. partners. Air Tahiti Nui CEO Michel Monvoisin had the opportunity to meet him and give him a tour of the company’s new aircraft.